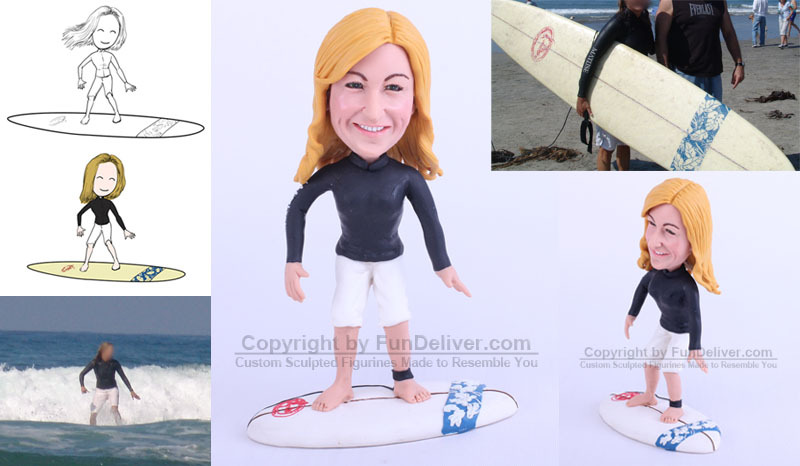 This is a completely customized cake topper for our client’s sister's 40th Birthday. This is actually going on a cake that looks like a wave, so on the top they want a surf cake topper to match the wave shape cake. 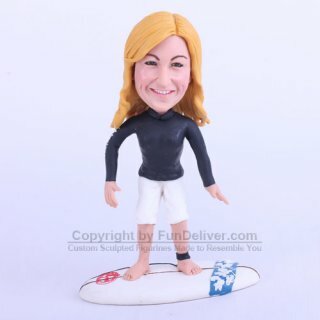 Top of figurine is black wet suit, bottoms white surfer shorts. Surfboard is white and picture above shows blue leaf pattern on one end and red emblem on the other side. For the pose, they would like her in the surfer pose with hair looking long. Surfers usually have a black strap that attaches to the ankle with a black rope that hooks to the surf board. It's in case the fall off they don't lose their board. They want this detail too, on the back ankle (near blue design of board).